At the same time America is graying, recent Pew Research Center surveys find that seniors are also moving towards more digitally connected lives. 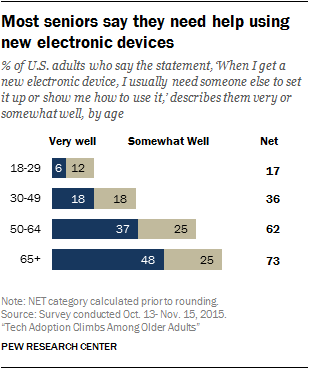 Around four-in-ten (42%) adults ages 65 and older now report owning smartphones, up from just 18% in 2013. Internet use and home broadband adoption among this group have also risen substantially. Today, 67% of seniors use the internet – a 55-percentage-point increase in just under two decades. And for the first time, half of older Americans now have broadband at home. 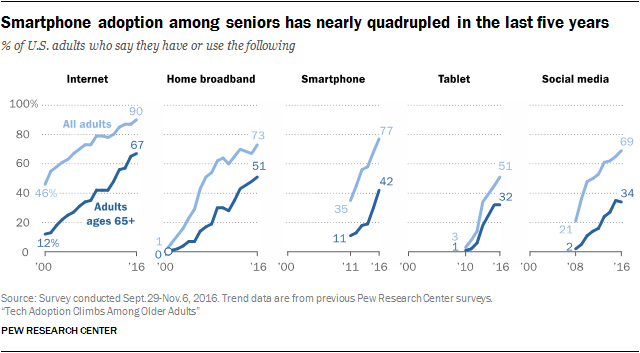 Yet despite these gains, many seniors remain largely disconnected from the digital revolution. One-third of adults ages 65 and older say they never use the internet, and roughly half (49%) say they do not have home broadband services. Meanwhile, even with their recent gains, the proportion of seniors who say they own smartphones is 42 percentage points lower than those ages 18 to 64. And as is true for the population as a whole, there are also substantial differences in technology adoption within the older adult population based on factors such as age, household income and educational attainment. 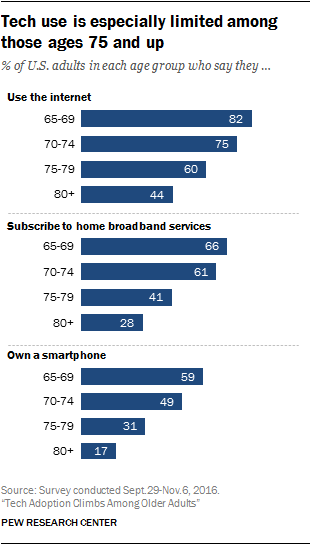 Seniors ages 65 to 69 are about twice as likely as those ages 80 and older to say they ever go online (82% vs. 44%) or have broadband at home (66% vs. 28%), and they are roughly four times as likely to say they own smartphones (59% vs. 17%). Adoption rates also vary greatly by household income. Fully 87% of seniors living in households earning $75,000 or more a year say they have home broadband, compared with just 27% of seniors whose annual household income is below $30,000. Educational differences follow a similar pattern, with college graduates adopting technology at much higher rates than seniors with lower levels of formal education. These younger, relatively affluent and/or highly educated seniors are helping to drive much of the recent growth in technology adoption among the older population as a whole. For example, smartphone ownership among seniors whose annual household income is $75,000 or more increased by 39 percentage points since 2013 – 15 points higher than the growth reported among seniors overall. Still, older Americans who use the internet tend to view technology in a positive light and incorporate digital technology into their everyday lives. Fully 58% of adults ages 65 and older say technology has had a mostly positive impact on society, while roughly three-quarters of internet-using seniors say they go online on a daily basis – and nearly one-in-ten go online almost constantly.